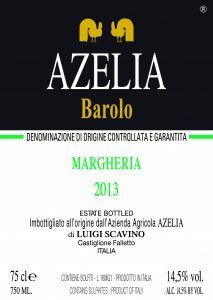 Azelia splits it Barolo holdings between Serralunga and Castiglione Falletto. Just outside the Barolo zone in Montelupo Albese, their Dolcetto vineyard Bricco dell’Oriolo is kicking out some delicious vino! If you read the Wine Bites Article reviewing a brace of Barolo from the 2004 vintage, you’ll see two of Azelia’s wines not get such a positive review from me. With those wines in the back of my mind, I had no great hope when I spotted Azelia’s 2013 Barolo and 2015 Dolcetto in a tasting line up. I was more than pleasantly surprised after tasting. Both delicious wines with lovely structure and development. The story behind the Dolcetto is intriguing. In the Barolo zone producers have grubbed up Dolcetto and Barbera to plant the more profitable Nebbiolo, often leaving only lesser sites for Dolcetto and Barbera. As always there are exceptions to the rule like Voerzio and his phenomenal Barbera. Azelia have taken a different approach. Just outside the Barolo zone lies Montelupo Albese with sites perfectly suited to Dolcetto. Don’t take my word for it just try the Vino. There’s few Dolcetto’s that pump out this much fun in a glass for the $. Along with Cavallotto, Bartolo Mascarello, and, Massolino, Azelia is now one of my go to Dolcetto’s, it’s not in the league of Bartolo Mascarello, it’s also about half the price. It’s just a bloody good, fun, drink! The 2013 Barolo is a stunner, sophisticated elegant, great poise and delicacy, lovely flowers, and, lingering flavours. It’s a great drink now Barolo, while you wait for bolder wines to settle and find their groove. I’ll be doing a Margheria smackdown with both Azelia and Massolino soon! Can’t wait! 45 year old vines from Montelupo Albese. From $27 in any 6. Sourced from sites across Serralunga & Castiglione Falletto with average vine age of 45years. From $80 in any 6. Sourced from sites across Serralunga & Castiglione Falletto with average vine age of 45years. From $180 in any 6. From the Margheria Cru in Serralunga with vine age of 50+years. From $170 in any 6. Sourced from sites across Serralunga & Castiglione Falletto with average vine age of 45years. From $340 in any 6. In front of the little church of the Madonna dell’Oriolo there are two stones. Legend was it that a miraculous oil with power to heal human beings oozed from them. Until one day a farmer used the oil to cure his animals. They were cured, but the magic stones ceased to give their precious oil forever. The Bricco dell’Oriolo represents, for Luigi, a maternal bond: it is the mother’s family, from Montelupo Albese, which owned this splendid vineyard in front of the small church. Single vineyard, south facing, unique location for a Dolcetto, at more than 600 meters of altitude: perfect ripening. The commune of Montelupo Albese is outside the area of Barolo production therefore the best positions, south facing, are not used for Nebbiolo but for Dolcetto. This is the reason why Montelupo is one of the best areas of the entire region for Dolcetto. This particular full south exposure permits a ripening otherwise unreachable for this variety. The high altitude allows to limit temperature range between day and night, conferring the wine an exceptional aromatic intensity. A small percentage of sand present in the soil further exalts the floral and fruity characters. Thanks to deep roots, the 45 year old vines which Luigi has rigorously wanted to maintain, make the grapes ripen excellently also in unfavorable vintages. Berries are more concentrated and produce a wine with spicy and mineral hints. 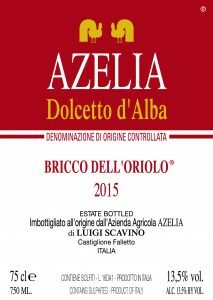 Azelia’s 2015 Dolcetto d’Alba Bricco dell’Oriolo is soft, open-knit and easy to drink now. The high altitude of these vineyards at 600 meters yields a restrained, perfumed Dolcetto with bright fruit and floral notes, along with mid-weight structure. Moody, autumnal scents of dried leaves, briar, old rose petals, dark cherries. There’s some sniffs of dark chocolate and chestnut savouriness too. Chestnut puree texture, that touch of satisfying grit in smoothness. There’s freshness here, juicy fruitiness, earthiness and cranberry-like acidity to close. Good length, good flavour, good vibes. It’s a wine to pull a cork on anytime, with gusto. Shift it into your ‘something different and satisfying’ repertoire. Luigi uses 6 different vineyards for the production of Barolo Base. They come 30 % from Castiglione Falletto and 70 % from Serralunga d’Alba. In Castiglione, where the soil is more calcareous and white, the grapes acquire elegance and an aromatic complexity while in Serralunga the more clayey soil transmits character and body. The vines of the six vineyards used for this wine are on average 40 years old. Ideal age, according to Luigi, for the production of a Barolo base. The mix of these vineyards produces grace and power, combining them together with wonderful balance. A vineyard of a rare beauty. Entirely facing south the vineyard is situated in the centre of the commune of Serralunga on the hill which extends below the castle of the town. The clayey and calcareous soil of Serralunga d’Alba shows all its complexity. The tufaceous marls confer richness in extracts and power to the wine. Minerality and sapidity: Margheria widely expresses the strong and austere character of this town. The 2013 Barolo Margheria shows its typically high-toned, aromatic profile. Scents of lavender, sage, mint, leather and earthiness meld into a core of dark stone fruits. Veins of bright acidity and salinity give the flavors an extra kick of brightness on the finish. The relatively high-altitude of this site and the limestone-rich soils yield a brilliant, salivating Barolo. The Margheria was aged in cask. Antonio Galloni, vinous.com, Feb 2017.